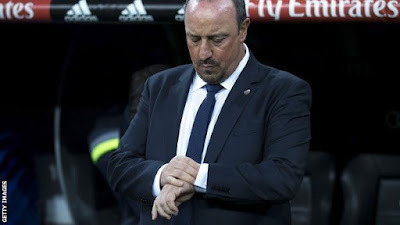 Benitez, 55, was only appointed in the summer, but fans chanted for him to be sacked after Saturday's match. Following a board meeting on Monday, club president Florentino Perez said: "He has all our support and confidence. "Rafa has only just started his job here. Let him keep working and he will achieve his objectives." Perez added he could "only talk about this moment". He said: "I cannot say what will happen in the future. No-one can say what will happen in six months." The 68-year-old rejected suggestions striker Cristiano Ronaldo, the Spanish club's record goalscorer, had told him he is unhappy playing under Benitez. "Ronaldo has never said anything to me about Benitez," he said. Perez - who returned to the club in 2009 having resigned as president in 2006 - was also a target for angry fans on Saturday. He said he understood their disappointment but asked them to display "more than ever" their "support to the team and to the players". Real's next game is at Shakhtar Donetsk in the Champions League on Wednesday, followed by an away game against Eibar in La Liga on Sunday. Benitez succeeded Carlo Ancelotti in the summer, with Perez describing him as "a man who breathes football, professionalism and the very ethos of our club". Saturday's defeat leaves Real third in La Liga, six points adrift of leaders Barcelona and two behind with city rivals Atletico Madrid. Spanish football journalist Graham Hunter told BBC Radio 5 live: "This is a proper crisis, when you are humiliated in that manner, and not for the first time in recent times. "Perez only had two options and the one he is taking is to back Benitez. If he was to sack him, where does he go? "Even when Perez resigned, things weren't as bad as this between him and the fans. "There are two reasons he hasn't sacked Benitez; he doesn't have anyone to replace him and also because the manager is a buffer. At the moment, when things go badly, Benitez will draw the criticism and is in the way of the president." Saturday's game was not the first time Benitez's approach has been questioned this season. He was heavily criticised for adopting negative tactics in the 1-1 derby draw against Atletico Madrid last month, while a ragged performance in a 3-2 loss at Sevilla a fortnight ago was similarly scorned by fans and media. After controversially replacing the popular Ancelotti in the summer, Benitez has been accused of failing to develop good relationships with his key players. An article in Monday's Marca newspaper said the squad had lost faith in the former Liverpool boss. Another report said players have taken to privately mocking their manager over his modest playing career and supposedly incomprehensible tactical instructions. They refer to him as 'number 10' - traditionally the intelligent playmaker who can read the game and see the spaces, things they do not think Benitez can do. Ronaldo's relationship with the coach has come under particular scrutiny, while Sergio Ramos, James Rodriguez, Isco and Karim Benzema are thought to be unhappy with the manager. Like Ronaldo, fellow forward Gareth Bale has been linked with Manchester United following a mixed start to the season. One consolation for Benitez is that much of the post-match criticism has focused on Perez, who has been accused by fans of meddling in team selection and constructing an imbalanced squad with his 'Galacticos' transfer policy. Real legend Zinedine Zidane, the coach of their reserve team Castilla, says he is not angling for Benitez's job. "I am coach of Castilla and Benitez of the first team. Things are fine at the moment," said Zidane. "If I stay at the club it is as the coach of Castilla. At the end of last season I had the feeling that I still lacked something to take over the first team. "I am doing things little by little and I am in no rush. The important thing is to be happy day-to-day with what I am doing." Ex-Real president Ramon Calderon told BBC Sport: "Perhaps he could decide to put Zidane in his place but I think it's very early. The next matches are easy ones in theory. And Benitez will be back. That's my opinion and I think I'm not wrong about that."